The time for holiday promotions and festive campaigns has come and this is also the time new promotion and advertising trends are being launched, too. 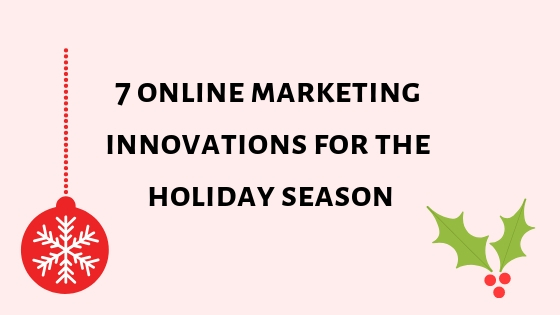 Some of the interesting trends I came across this winter focus on online and offline shopping, local marketing and display ads. 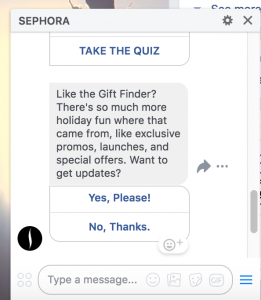 You can now create Facebook Messenger campaigns for e-commerce. This is a great way to engage with users and interact. It might feel at first intrusive, but it also allows you to get a simple yes- no answer from the user and only show to the ones who are interested. To create a shopping campaign on Messenger, you must start by choosing a campaign objective “Messages” and also add a product catalogue. 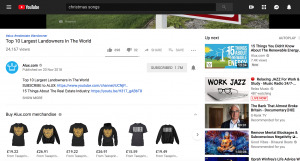 This is not an ad, but an integration of a Teespring product feed under an organic YouTube video. Teespring is a website for creating and selling merchandise online – teeshirts, mugs, hoodies, etc. YouTube creators with more than 10 000 followers can now sell their swag under their latest videos. Even though it is limited to bigger channels, this feature may become available to more people in the future. Local Inventory Ads or LIA is a great way to combine a shopping campaign with promotion of a physical location. It is easy to implement – just requires you to just tick a box, while creating your Google shopping campaign and have your Google My Business account connected to your Google Ads account. Your store location must be verified, too. 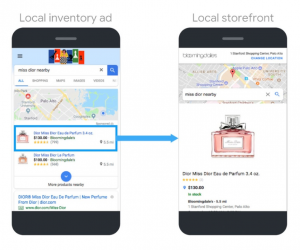 What happens then is that Google is showing your ad in searches from devices in the physical proximity of your store with a snippet of the map. This is a great way to get discovered and drive foot traffic to your door. 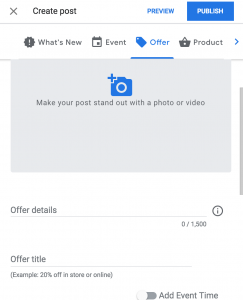 This is a free feature which allows you to post an offer from your Google My Business account. The end result looks like an ad, but it is a free part of your listing on Google Maps. When people click on it you can create a button taking them to the relevant page with the promotions. The post expires after a few days, so you must regularly update the information. If you are running ads, try the promotion extension. This allows you to enter a specific holiday occasion for which you have the offer. You have a variety of options from different religions and occasions. The extension is displayed under your ad with a little price tag, showing the discount amount, the occasion and the item. Like all extensions, promotion extension helps you increase click through rate and occupy bigger real estate in the search results. On the topic of shopping, Universal shopping campaigns are the newest and most interesting solution. 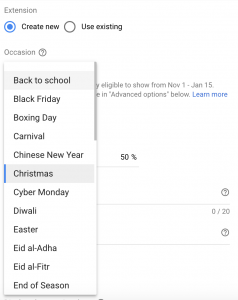 The campaigns allow you to combine assets like images, video and text and show your ad across variety of Google’s properties – Search, Display, YouTube and Gmail. The targeting and bidding is fully automated. The campaign is meant to help advertisers focus only on the profitability of the campaign, instead of troubleshooting ads and adjusting bids. These are two new audiences available on YouTube ad targeting. Customer events are focused around marketing to people around important events in their life – graduation, wedding, new home, etc. Customer patterns are groups of users according to their spending habits – deal seekers, frequent restaurant goers, binge shoppers, etc. 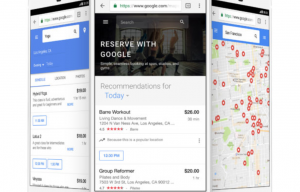 Google Reserve is one of the newest features which helps search and creates a great experience online. It allows users to make online bookings and even payments to businesses which require appointments like restaurants and beauty salons. The booking happens through a partner software like Treatwell, Book a Table, etc. It is free for businesses, however they still have to pay a commission to the booking software for the transaction. This entry was posted in Marketing Strategy, PPC, SEO and tagged Facebook, google shopping, local. How to Create Dynamic Search Ads ?